Some more of my design work. 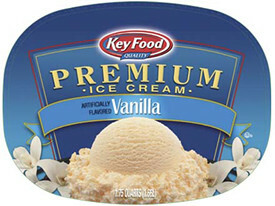 Here's a recent ice cream lid design for Key Foods, who I believe, are based in the New York area. Unfortunately, we rarely get finished printed samples from the client. So I'm often retrieving digital files from previous projects in order to add them to my portfolio. Hence showing the lid image and not an actual carton.